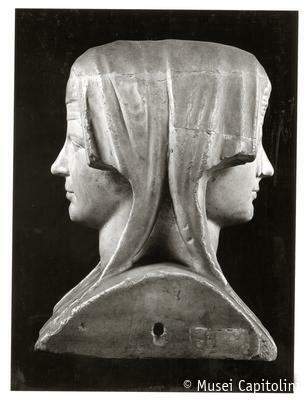 The double veiled herm shows identical faces on either side; the juvenile physiognomy of the faces is scarcely characterized (with the exception of the fleshy lips, with side dimples) and it is difficult to define the gender of the figure depicted. The head-dress consists in a tall polos covered with a veil fastened across the forehead by a band; lappets fall on the shoulders. It has been put forward, albeit without any evidence, that the sculpture might be a Roman replica of a prototype representing a Greek Hermaphroditus dating to the late fourth century BC. The Capitoline herm can be dated to the 1st/2nd century AD. The sculpture was purchased for the Capitoline Museum from the collection of cardinal Alessandro Albani in 1733.